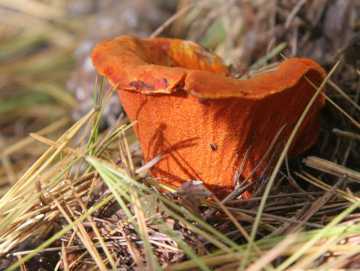 This lobster mushroom in the Headwaters Conservation Area is the color of cooked lobster, thanks to an infecting fungus known as orange mushroom pimple. The cap is deformed in a way that makes it look like a lobster's claw when seen from above. A bright orange lobster claw sticks out of the ground beside a trail. It's a weird sight worthy of Halloween, brought to you from the strange and colorful world of mushrooms. This so-called lobster mushroom is not one fungus, but two. It's a mushroom with a fungus. That's right, a fungus with a fungus. Lobster mushrooms form when a fungus called orange mushroom pimple (Hypomyces lactifluorum) infects a common white mushroom (often one of the Russula or Lactarius mushrooms but occasionally a poisonous Amanita). This infection gives the common mushroom a deep orange color, like the color of a cooked lobster. The infecting fungus also deforms the mushroom so it comes up in an odd shape. Sometimes it looks like a lobster's big pincer claw, instead of a normal mushroom cap. One place in Westborough where lobster mushrooms are likely to appear is along the trails in the Headwaters Conservation Area behind the Mill Pond School. The trail-sides in the vicinity of the teaching platform are good places to look. You may also find them elsewhere in town. The recent deluge of rain has created the damp conditions that encourage mushrooms to grow, especially during the fall mushroom season. In the case of lobster mushrooms, the infecting fungus is not a mushroom, but rather, a "sac fungus". Many of the molds that we commonly see growing on fruit and stored food are sac fungi. The mold that produces the antibiotic penicillin is a sac fungus. The bakers' yeast and brewers' yeast that bring us bread, beer, and wine are also sac fungi. Some sac fungi do produce mushrooms or other large fruiting bodies of their own, such as the mushrooms known as morels. Still other sac fungi cause us problems such as athlete's foot. Both the Dutch elm disease that destroyed the American elm trees and the chestnut blight that wiped out the American chestnut trees are caused by different types of sac fungi. The sac fungus in lobster mushrooms is called orange mushroom pimple because it sometimes looks like tiny pimples on the mushroom. It deforms the mushroom's gills and prevents the mushroom from producing spores. Instead, the orange mushroom pimple produces its own spores. If you happen to see a lobster mushroom that is broken open, you'll probably see that the inside of the mushroom is mostly white. The areas near the surface are orange and pimply, where the sac fungus is growing and producing spores. The name lobster mushroom might suggest something good to eat, but the name orange mushroom pimple certainly does not. Which is it? It's hard to say. Some experts who gather and eat wild mushrooms regard lobster mushrooms as a tasty delicacy but only IF they can positively identify the infected mushroom as one that's not poisonous or inedible. That's a pretty big "if"! Mushroom identification is a challenge, even for experts, and the deformities due to the infection make identification extra difficult. As with other mushrooms, don't try them on your own. Once you start looking around the woods, you may find other orange or red mushrooms. Some may be waxy-looking and tiny. In fact, you'll probably notice mushrooms of many different colors. They come in yellow, purple, lavendar, green, and grey-blue, in addition to many kinds of brown, gray, beige, and white. Different types of mushrooms come up from early spring through early winter, but fall is the best time to find many of them. As the wildflowers and colorful leaves disappear, we can look forward to seeing a great abundance and variety of colorful mushrooms in Westborough's woods.